Luis Vega is cast as Oliver in William Shakespeare’s AS YOU LIKE IT at the Guthrie Theater. Directed by Lavina Jadhwani. 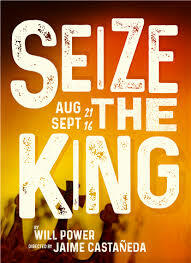 Luis Vega joins the cast of Will Power’s SEIZE THE KING at The La Jolla Playhouse, directed by Jaime Castañeda. Luis joins the national tour of The Humans in the role of Richard Saad. Directed by Joe Mantello. Luis plays Luke Jacobs in the world premiere of Harrison David Rivers' WHERE STORMS ARE BORN at the Williamstown Theater Festival. Come see Luis as El Mago in Paola Lázaro's World Premiere Premiere Production at Atlantic Theater Company!! Tickets are going fast...buy them here. 2017 Austin Latino New Play Festival!! A staged reading of THE LAST BARNSTORM written by Luis Vega will appear as part of Teatro Vivo's annual New Play Festival on March 4, 2017.